Just hours after President Trump reportedly signed off on tariffs targeting some $50 billion in Chinese goods (a decision that was finalized after a 90-minute meeting with officials from the West Wing, as well as senior national-security officials, the Treasury Department, the Commerce Department and the office of the US Trade Representative), Chinese Foreign Minister Wang Yi said during a press conference in Beijing that China is prepared to retaliate as it takes a more confrontational approach against the US on trade, according to the Wall Street Journal. Wang’s comments reportedly followed face-to-face talks with Secretary of State Mike Pompeo, where Wang urged Pompeo to choose a path of “cooperation and mutual benefit.” Pompeo was in Beijing to brief Chinese officials on the North Korea summit. On Thursday, Chinese Foreign Minister Wang Yi said China and the U.S. faced a choice between cooperation and mutual benefit on the one side and confrontation and mutual loss on the other. “China chooses the first,” Mr. Wang told a joint news conference, after talks with U.S. Secretary of State Mike Pompeo in Beijing. While the official breakdown of Trump’s tariffs won’t be released until tomorrow, a CNBC source noted that Trump has already signed off on the tariffs, and that a list of talking points has been distributed to 10 government agencies, while a list of products has been uploaded to a government database. As we noted earlier, one factor that could sway Trump’s thinking on tariffs would be an aggressive response from China. 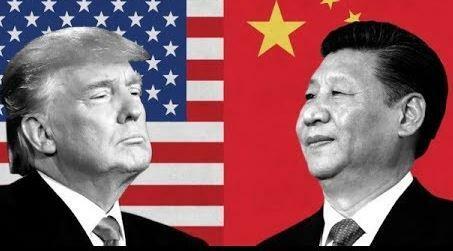 Earlier on Thursday, Xinhua, China’s state news agency reported that President Xi Jinping had told Pompeo that he hopes the US will tread carefully when it comes to sensitive issues like the US’s relationship with Taiwan and the simmering trade conflict so as to avoid a serious breakdown in bilateral ties between the two countries (ties that, aside from the trade spat, are also being tested by military brinksmanship in the Pacific). The list of goods that will be subject to the new levies is expected to include between 800 and 900 products, slightly less than the original list of about 1,300 products on a list published by the US Trade Representative in April, as we pointed out earlier, While the two countries have been exchanging trade-related threats for months now, it’s still unclear when the US tariffs will go into effect. Congratulations to President Trump. He has brought about so many positive changes for America. Our Economy is stronger, Unemployment is down, Foreign policy has just reached an all time high, with the signing of Deneuculazation with North Korea. Face to Face dialogue with North Korea, something that previous administration’s could not accomplish. He has held up under TREMENDOUS PRESSURE TO TOPPLE HIS PRESIDENCY. HE HAS REBUILT OUR MILITARY AND IS DETERMINED THAT OUR COUNTRY GET BACK TO FOLLOWING THE LAWS LAID OUT BY THE CONSTITUTION. HE IS DETERMINED TO BRING THOSE RESPONSIBLE FOR AIDING HILLARY CLINTONS “GET OUT OF JAIL” CARD BROUGHT TO JUSTICE. HE HAS KEPT HIS PROMISES TO THE AMERICAN PEOPLE, EVEN THOUGH HE HAS had to FIGHT FOR EVERY BILL HE HAS BROUGHT BEFORE CONGRESS. ELECTED DEMOCRATS AND LIBRALS HAVE SHOWN TOTAL DISRESPECT FOR OUR ELECTED PRESIDENT IN WAYS THAT EMBARRASS MOST AMERICANS; SITTING ON THEIR HANDS DURING THE PRESIDENTIAL ADDRESS TO THE NATION. THEY COULDN’T EVEN MUSTER A CLAP WHEN THE WIFE OF A SLAIN POLICE OFFICER WAS RECOGNIZED. THE JUDICIAL COMMITTEE HAS TIME AND TIME AGAIN SHOWN EVIDENCE OF GUILT WITH SO MANY ELECTED OFFICIALS, YET THEY REMAIN IN OFFICE DRAWING SALARIES AND PENSIONS WHEN THEY RETIRE. IT IS TIME FOR THIS MADNESS TO END. INDICT THE GUILTY PARTIES, OBAHMA, CLINTON’S AND ALL THOSE CURRUPT ENTITIES THAT HAVE KEPT HER OUT OF JAIL, SCHUMER, PELOSI, WATERS, HEAD OF IRS, HEAD OF OBAHMA’S HUD PROGRAM, FBI, MUELLER AND THE LIST GOES ON. AMERICANS SHOULD BE ABLE TO TRUST THOSE THEY ELECT FOR OFFICE, INSTEAD WE HAVE MANY CORRUPT CRIMINALS SITTING IN SEATS, THAT DO NOTHING EXCEPT DRAW SALARIES FOR A LIFE TIME AND RUN THEIR OWN AGENDA TO HINDER POSITIVE, AND MUCH NEEDED REFORM FOR EXISTING BILLS FROM COMING TO FRUITION. I, for one knows that not everything President Trump does is not favor with everyone. We MUST keep in mind that the Democratic Party nominate HILLARY CLINTON to run against DONALD TRUMP. BERNIE SANDERS stepped off the platform for HILLARY CLINTON, WHO WE KNEW EARLY ON TO BE A LESS THAN WORTHY CANDIDATE. DONALD TRUMP WON HANDS DOWN AND IT IS TIME HE IS REPECTED AS OUR UNITED STATES PRESIDENT. HE WANTS AMERICA TO BE GREAT AGAIN. I APPLAUD HIS EFFORTS TO END THE OPEN DOOR POLICY TO ILLEGAL IMMIGRANTS. I THINK IT UNWISE TO ALLOW TERRORIST TO ENTER OUR COUNTRY WITHOUT OUR KNOWLEDGE. WE HAVE A GREAT SYSTEM TO WEED OUT THOSE THAT SHOULD NEVER BE ABLE TO ENTER OUR BORDERS, FROM THOSE THAT NEED AND SHOULD BE ALLOWED TO BECOME AMERICAN CITIZENS. ALL OF THE RAPES, MANGLING, AND MURDERS MUST END. IT’S TIME TO DO OUR PART IN MAKING AMERICA GREAT ONCE MORE. LET’S PUSH TO INDICT THE LAW BREAKERS IN OFFICE. MANY OF THESE ENTITIES WILL RETIRE AT THE END OF THEIR TERM, ONLY TO RECEIVE LIFE LONG PENSIONS ND PERKS. WHY SHOULD WE THE TAX PAYERS PAY FOR THEIR YEARS OF CRIMINAL ACTIVITY. HAVE YOU EVER ASKED YOURSELF, HOW IS IT THAT SENATOR’S AND CONGRESSMEN LEAVE OFFICE AS MILLIONAIRES. CORRUPT BEHAVIOR WHILE IN OFFICE IS HOW THAT HAPPENED. MITCH McCONNELL, KERRY, AND SO MANY OTHERS WERE INVOLVED IN THE PLAY TO WIN SCHEME WITH HILLARY AND SAUDI ARABIA. PLEASE JOIN ME AS WE PRAY FOR OUR COUNTRY TO BECOME WHOLE AGAIN WITH JESUS AT THE HELM OF ALL DECISIONS OUR LEADERS MAKE.